how much would this cost on my ankle? Depending on exact size anywhere from $80-120ish. Pricing would depend on size and placement on the body. Our shop minimum is $60 so I would say $60-100ish. Our minimum is $60 so anywhere from $60-100ish.. It really depends on exact size and font style. Pricing depends on what we are doing. Our shop minimum is $60 and pricing goes up from there. Hey, I was wondering how much a tattoo similar to this would be. Depending on exact size and placement, anywhere from $150-300+. Hey Sketch, im a big fan of your work! How much would you charge to do a tattoo similar to this on my forearm/ possibly bicep tricep area? I live like two hours away or i would stop by. Roughly how much for an entire traditional colored sleeve? How much would it cost to get a 3in by 3in tattoo on the shoulder? It’s supposed to have a yellow rose in the middle with 4 koi fish circling it. Depending on the amount of detail involved it could be anywhere from $100-170 but trying to get a lot of detail into the koi fish with such a small tattoo usually doesn’t work out well. Sketch would need to see the design in person to be able to let you know the smallest he would recommend going without risking loosing detail. One of my friends referred me to look up sketch and his work is beyond amazing. I’m an out of state college student on the look out for a new artist. Is there any way I can talk to Sketch via email? I have a large “bio mechanical” piece taking up the upper part of my right arm. Unfortunately, the artist disappeared before he finished the work and has been left unfinished for years. Do you do big cover ups/ finish work? I know it’s someone else, but I would appreciate it more than you’ll ever know, if you could help me out. Hello! I’ve been looking for a good parlor for a year now, and I was recommended to check you guys out by a friend with tattoo experience. I’m starting small (really small) with a line-art lightsaber on the inside of my middle finger. Could I get a price estimate in preparation for coming in? Thanks a bunch! Would you give a 14 year old a tattoo with parent consent? No, here in Jasper County we cannot tattoo minors, even with parent’s consent. How much do tongue piercings cost?? Im 17 but my mom is wiling to sign off on a small tattoo of my dogs paw print. Can you do it? Would just taking a picture of my dogs paw print be enough? How much would that be? We are not able to tattoo minors in Jasper County, even with parental consent. Missouri allows it but Jasper County has an ordinance that prohibits tattooing under the age of 18. Eventually, I will have all of these tattoos done, but what would something like these cost? Well, we have a 60.00 minimum. Price goes up from there. 50-150.00 an hour is the average cost of tattoos. I was wondering how much it would be to get a tattoo done on my forearm of my sons name and the date? Pricing depends on size and detail so anywhere from $60 (our minimum) to $200+ for full forearm. That tattoo that size would run 4-600.00. Depends on exact size. I have a HarleyQuinn/Joker tatt I got started while I lived In Memphis. I had to move do to my job and REALLY need it completed. Can I schedule a meeting to see if you can finish it or know someone who can? How good are u at doing tattoos on a neck?? I had a tattoo done almost 3 years ago by sketch on my foot, it has faded quite a bit. Am I still able to get it touched up, or how much would it be? Shop policy is touched up for free within the first year but since Sketch is still here I’m sure he wouldn’t charge ya. His touch up days are Mondays and Tuedsays. Without knowing what kind of cross and how big of an area you want to cover, it could be anywhere from $120ish up to $250ish. how much would it cost to have 12 lines (3/8th’s – 1/2 inch in length) on my wrist? It’s a long story – but I had 12 lines that had scarred. They’ve since faded, and I’d like to “put them back”? Not wanting black – but rather for them to resemble the scars they had been. I am positive we can cover it with wings and some lettering. probably 120-150 or so should do it. I’m looking to get a half sleeve on my upper arm. I was wondering about how much that would cost? probably 700-1300, somewhere in there…. I have an old & bad tattoo in my abdomen its about 1 1/2 by 3 inches. I want it covered with something custom, I’d like a pheonix. Problem is…its not even in a good place…just above my naval (I was young and stupid). Not sure what could be done but need it done ASAP. Tired of looking at it & want it gone before bikini season for sure. Wouldn’t mind doing a side piece that stretches over & covers it. What would the highest price range be? probably going to be 150-300.until i see it. We were wondering if you could do a 3mo old baby boy foot and hand print on two separate people how much would it cost? Yes we can.. We would just need you to bring in the inked hand and foot print you would like tattooed and we will make copies and get ya hooked up. Pricing would run around $100 up to $175 each, all depending on the prints and if you would want names or dates also. Hi Sketch i was looking at getting a tattoo and wanted a cool design like this http://www.tattoobite.com/wp-content/uploads/2014/01/canadian-flag-tattoo-design-2.jpg but i want it to be a canadian and american flag mixed together cause i am originally canadian how much would i be looking at for this on my right pectoral? I was wondering how much it would cost to get a small snowflake behind my ear. Depending on the style and detail of the snowflake it could be as cheap as $40 (our shop minimum) up to $70ish. I have a tattoo that I want that will cover most of my side…approximately 16 words and six names…I want it to looked like cracked skin and would like to know an approximate cost? send pics to info@bodyaccentstattooing.com. will need to see size and amount of work to be done. no matter how bad, i guarantee it can be fixed or covered. I want this tattoo but quite a bit smaller with no color. I don’t want it to be all the way up my hit but on my thigh. I loved my first tattoo from Sketch and was wondering what an estimate would be on this? if it covers the whole thigh it’s gonna be in 5-900 area. anything the size of your stretched out hand is from 150-300, depends on detail and size…..
just stop in on mon-tuesday between 12-8 and we will get you touched up. or call at set up a time. pop in mon-tuesday 12-8 and we will get you touched up. I wanted to know how much a tat would cost that reads. He asks, do i love him? i say forever-kd amd how much it cost for a tat of lips. I also have a cross on my neck not very big i want to know how much it will cost to go over it is crooked. Thank yall!!! I wanted to know how much it would cost on my inner upper are to write he asks, if i love him i say “Forever”-KD and also wanted to know i have a small cross kinda behind my ear its crooked amd need gone over to straighten out i need a price on that also. Lettering should be about 130-170 and cross would be like 50-60. give us a call to set an appointment time. Can you do cover ups? Just moved to the area and looking for some one that knows what they are doing. Everything I have on me needs work. So I would be a returning customer if the first one is done good. Let me know if u still work here. And I will stop by this weekend and see what u can do for me. I’m almost 19 and I think I’m wanting a cute little foot tattoo. I’m really nervous about it, and don’t want to get something that will look bad, or I’ll regret. I was thinking like “let it be” in cursive with some cute little birds beside it… How much do you think that would cost. ?? And have you done anything like this before???? It may be 60-120 depends on size. and don’t be nervous we do this sort of thing every day. I have a really messed up tattoo on my right front hip and I was to get it covered up. I’m wanting to get a cancer ribbon with angel wings to cover it. I want cheetah print in the cancer ribbon and color in the whole tattoo. I was wondering if you could give me an estimate of the cost for it! The current tattoo is about 3-4 inches long and about an 1-2 inches wide. probably between 100-150. Give us a call and set a time. We will endeavor to cover that up for ya. I absolutely LOVE my tat you did amazing job covering up that ugly tat I had. Me and my family will be seeing you a lot. Mine is so beautiful Thank you see you soon. I have an idea of a tattoo I drew of a support ribbon and a banner that goes across it.. I need an estimate if how much it would cost to get it so I can set up an appointment to get it. Brooklyn and Karen Sims suggested I go to you since you did an amazing job on her tattoo!! Please respond when possible. Thank you so much for asking us. Our minimum is $40 and if you would like an estimate on the piece we would be more than happy to giv3e you one but we will need a little more such as a picture, size and placement. (it does not have to be a perfect picture just an Idea so we know what the tattoo will entail.) you can email it to us at info@bodyaccentstattooing.com or sent it to us in a comment 🙂 Thank you! Thanks Janet, We are very happy to hear how much you loved your work Sketch has done for you. We are looking forward to seeing you come back 🙂 Thank you very much! I got a tat by sketch a few days ago I absolutely love it. Very good work very professional and not over priced. Thank you so much for letting us know how happy you are with your work. Sketch is a great artist and we are Happy to have him. Thank you for the positive comment, we hope to do more work on you soon!!! 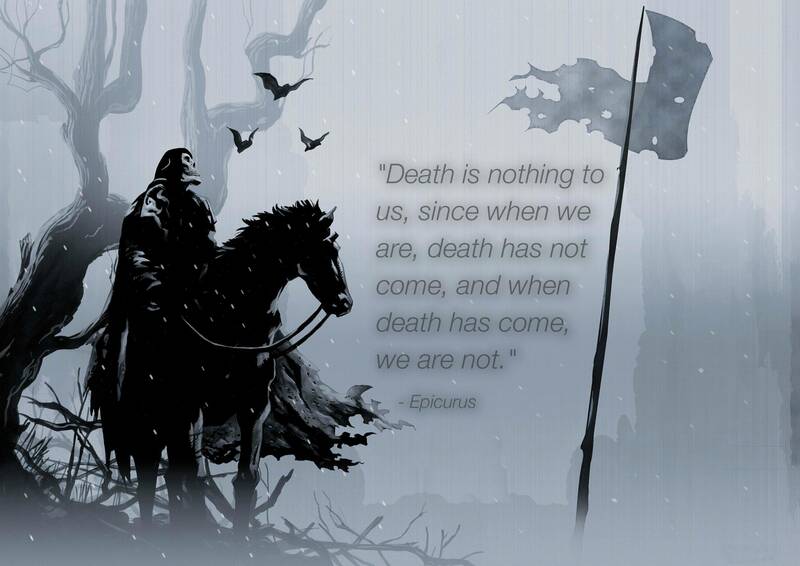 I’ve always wanted this as a tattoo on my back, but just the Reaper and horse, birds, and the quote. Could you by chance give me an estimate of how much that could cost? Here in Jasper County we’re not allowed to tattoo under the age of 18, even with parent’s consent. Anywhere else in Missouri is 15 or 16 and up with parent’s permission I believe.